Traffic officers perform an increasingly difficult job and they are highly trained. However, we explain here why it's not a good idea driving around the UK with no idea of your rights or of how speed detection equipment works. The following could well happen to you, and it may already have, so please read this very carefully before you continue. Recorded the speed of his patrol car as "the speed of the target vehicle". This link explains why he didn't use the equipment! Even then he only selectively recorded the speed of the patrol car. He selectively recorded what the driver said; most Constabularies' traffic officers caution the driver and record what is said – but that isn't mandatory. The driver told the officer "I could see that you were in a hurry and I was trying to get out of your way". That's called "recording the explanation for your actions". There was no speeding ticket issued, nor did the driver ever receive a written NIP (Notice of Intended Prosecution). As there was no speeding ticket he never found out and still doesn't know what speed he was being prosecuted for. Speeding is an "absolute offence" - the problem is that the punishment depends on the speed. The driver didn't "decline to view the video" either. Make sure that you take the time to have the evidence explained to you when you're stopped. Thanks to this case everybody now has a right to a personal copy of their traffic video, too. Radar can't be used in moving vehicles in the UK, which means that there are no "automatic" systems available, so the police use 'time and distance devices' which are nothing more than glorified stop-watches. The important thing to know is that they are manually operated and traffic officers must be trained in their use. The officer in our case didn't use the speed detection equipment as he preferred to use his patrol car speedometer! 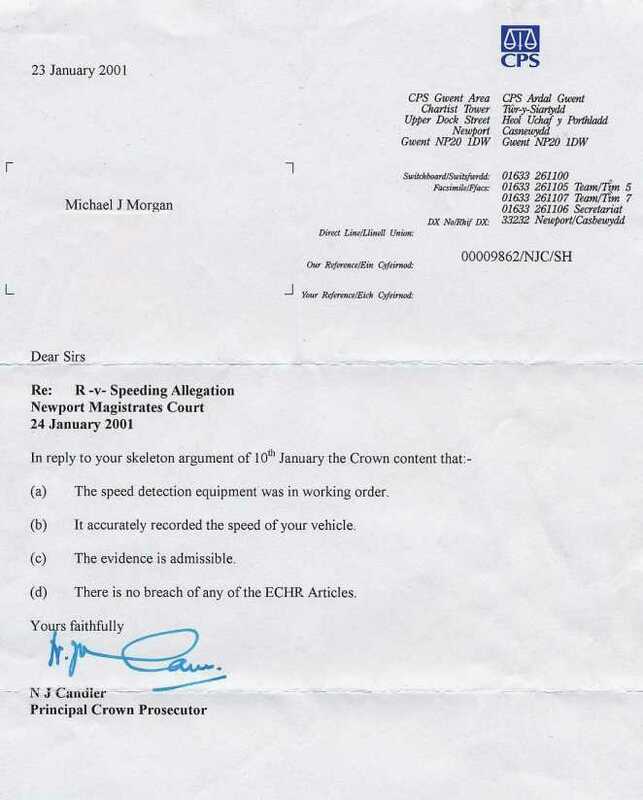 His reasoning (that he personally doesn't favour using shadows from motorway gantries) seems to fly in the face of the ACPO recommendations for the use of this kind of time-and-distance speed measuring equipment. The speed measuring equipment wasn't operated (the target vehicle's speed is shown as "0.00 mph" throughout). He wasn't maintaining a constant distance during the periods when he noted his patrol car's speedometer readings. As the Association of Chief Police Officers acknowledges in its guidelines, measuring a vehicle's speed using the patrol car's speedometer is only possible if you maintain a constant distance - hardly the situation in this case. The problem with all of this is that this officer's an instructor in the use of the equipment, has 22 years Traffic experience. and has received two weeks training at Hendon specifically in the use of the ProVida equipment - including its use for measuring a vehicle's speed. Between them he and his colleague (PC 287 Lane) couldn't even manage to push a single button once on the ProVida "police pilot" during the 7 minutes of the incident. This link will help you understand why they may "prefer not to use" the very accurate equipment provided by the taxpayer! If you've been stopped by a Gwent Police patrol vehicle and subsequently convicted of a speeding offence based on police evidence, your conviction may have been unsafe. PePiPoo can offer independent expert opinion and accurate speed calculations based on information that obtained from your Traffic Video.